It’s possible to do a surprising number of things from a kayak. Many people fish, with good results. One islander even goes shark fishing in his kayak. Picnicking is also an ideal kayak activity, since there are so many shallow and protected areas in which to stop. For years a group of local women have kayaked together weekly from the north part of Bimini Bay, out the channel then north to the pier restaurant for something to eat. There is a kayak nature trail among the mangroves south of Manatee Avenue. There are plenty of easy launching locations at the south part of the island, too. And on gentle days it’s fun to paddle in Gulf. Rental kayaks and guides are available who can provide all your equipment and instruction if you need it. Be sure to have a life vest onboard and to wear it if you are not a strong swimmer. And check the weather forecast before venturing out far. Then enjoy a quiet sport that can be used either as a great full body workout or as a way to completely relax and drift with the breeze and current. 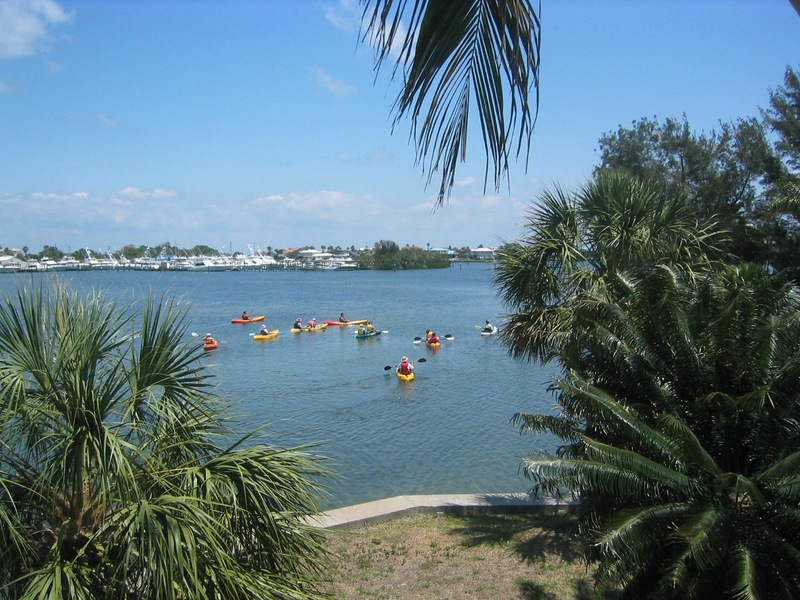 Either way you’ll be sure to enjoy kayaking on Anna Maria Island. Where would you recommend renting kayaks? I saw photographs of the Grassy Point Preserve mangrove tunnels and thought it looked unique. Is that what you are referring to when you say, “nature trail among the mangroves south of Manatee Avenue”? Any other specific locations to explore? Thanks! We are coming next week. Hi Annie. Yes, Grassy Point Preserve is south of the Anna Maria bridge and east of the shopping strip with Walgreens. It can be accessed from the north side by launching at the Kingfish boat ramp, or at the picnic area on the south side, which has limited parking. Many people kayak within Bimini Bay and launch from the Holmes Beach public boat ramp on 63rd Street east. Kayak rentals are available from Native Rentals, Just4Fun, Beachbums, Fun and More. They can deliver to your location or meet up at a selected site. The “SurferBus” rents kayaks and paddle-boards on Manatee Avenue waterfront just west of the Robinson Preserve entrance, where you can launch and return without transporting equipment.